Celebrating this great earth of ours is such a fun thing to think about- especially in a STEM classroom! We have so many activities we do in preparation for Earth Day in April- but really a lot of these projects will work all year long! 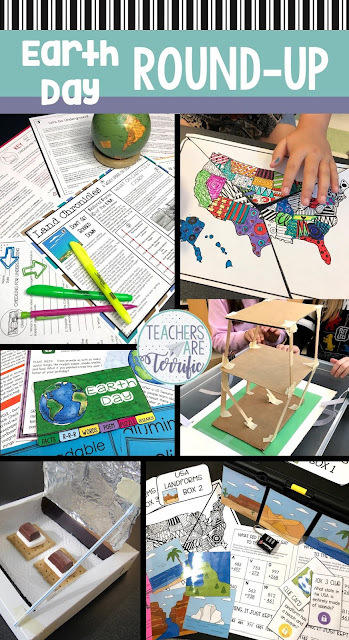 Join me with this post as we explore why Earth Day projects can make the best day ever happen in your classroom, too! Get ready to explore with your amazing engineers! BONUS: I am going to mention several additional projects sprinkled throughout this post! We do many of these at the same time with three different grade levels. I love a theme week, don't you? Fifth graders must design a gravity fed water tank that will drain into a holding tank. They use straws for the pipes and when they are ready- we pour in the water. Check out that photo where you can see water dripping! I love watching this one. The kids squeal when the device works and they run to grab towels when a leak begins to drip. This is a challenge I complete with third graders! While they are doing this one my fourth graders are completing the Earthquake Challenge and fifth graders are working on Flood Control Barriers. This makes another busy week all about the earth! The theme for this week is Earth Week (of course)! I love this challenge as much as the kids! First, they experiment with different materials lining the oven and different materials in the lid of the oven. We use thermometers and lay the boxes in the sun for five minutes. The students keep a data table showing the temperatures. The design challenge is to fill the box with the most effective heat absorbing materials and then we cook! TIP: Buy the marshmallows that are made for cooking s'mores. These are flat marshmallows that work well for this little oven. The first time we tried this challenge I used jello pans. We placed our earthquake resistant buildings on the jello and shook the pans. It was great fun! Really. But, since then I tried another way to do it! I built a shake tray! I used an under-the-bed storage box and a piece of foam board. The foam board is held aloft by pieces of elastic that are clamped to the sides of the box. It really works great and those little buildings will definitely topple over. TIP: If you use foam board in your classroom I hope you live near a Dollar Tree. That store has pieces in black and white for $1. Another Earth Day topic! I have so many projects for this! Let's start with a Landform Escape Room. Students must identify landforms, solve math problems, and place events in chronological order. They will use a display map with clipart images of the landforms to solve the puzzles and determine the lock code for three locked boxes. When they open the last box you have the option of using a doodle map puzzle they have earned or you can move on to a STEM Challenge. The STEM Challenge is to design and build a landform model that includes at least ten landforms. TIP: Try an Escape Room with your class. You will love it. They will love it. And it's priceless learning at the same time! While the big kids are completing the Landform Escape Room, my third graders are doing the Volcano one. And, of course, we are calling this Landform Week. This one has a spectacular STEM Challenge that my third graders love! 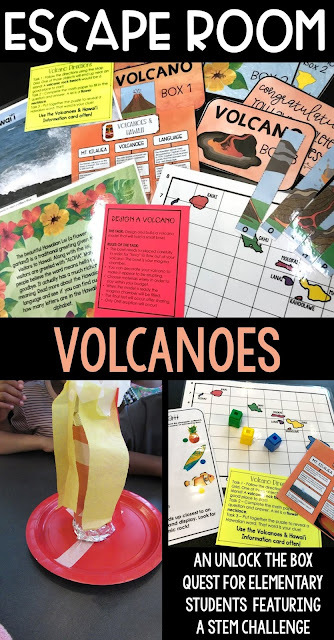 This Escape Room includes using a map grid, completing a math paper, and piecing together a volcano puzzle. The STEM Challenge included with it is to design and test a volcano model. We use baking soda and vinegar to "erupt" the models. TIP: As silly as it is to make a volcano erupt with baking soda and vinegar it never fails to make kids get excited. I make sure they understand this is not a real volcanic eruption and we talk a lot about chemical reactions and then we enjoy the spewing and bubbling. Do it! And, now a way to grab your student's attention and get them to write and read about landforms. I love these booklets and reading passages so much. And my students do, too! It also includes a "newspaper" with 3-4 articles about landforms. The newspaper has three graphic organizers you can use. Super and oh, so easy- just print and read. TIP: Use these on those yucky days you don't feel so well and need a sub, for early finishers, or even as an activity to complete at the end of the Escape Room. The Flipper booklet is also a kid favorite! My students love making these little flippers. They call them "tiny books". This one is specifically about Earth Day. Students fill in information about Earth Day, write about ways to reduce, recycle, or reuse, write a poem about Earth Day, match vocabulary words, and complete a puzzle. TIP: The resource is provided in color and black/white. Print one in color for yourself and use it as a model for students to color their own. Whatever you choose, have fun and maybe the best day ever, as you celebrate the earth! Thank you so much!! I love your products and ideas! !